This chassis is very clean and in VERY GOOD condition. It has only raced in 17 total races… 2 races in 2017 and 15 races in 2018. The Praga Dark 2 is Praga's latest model designed for racing conditions in the United States. The goal was to design a chassis that performed best with "out of the box" settings. 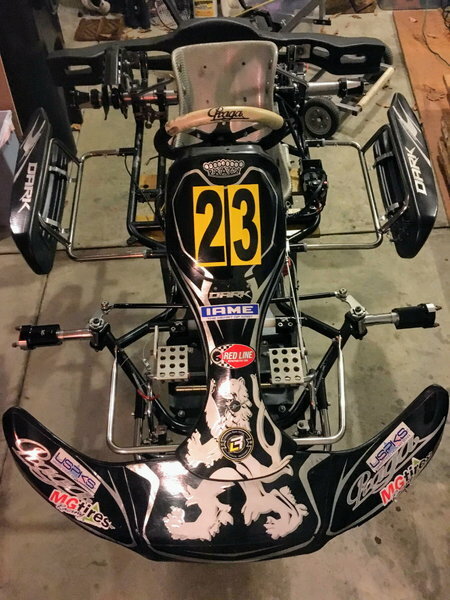 The kart shines with the standard stock axle, middle ride heights, and standard seat stiffness. Because of great balance with standard settings, the chassis has plenty of adjustment to increase or remove grip. Designed for ages 12 and older in the Junior, Senior, and Masters categories. Cost: $1,995. Serious Inquiries only please.